After removing any scent from your hunting clothes with Scent-a-Way laundry detergent, store them in bag to keep them scent-free. Few animals are as challenging to hunt as late-season varmints. One of the reasons behind this high level of difficulty is the fact that these predators rely heavily on their sense of smell to lead them to food and to keep them out of harm's way. There are ways to skirt around a predator's olfactory senses. The best way is to eliminate human scents before you ever enter the field. Big game hunters have been doing this for years, and while eliminating your scent does require dedication, commitment and a little extra time, the end results can be nothing short of astonishing. Scent elimination for varmint hunters begins as it does for big game hunters, with washing your hunting clothes and all washable accessories in a scent-eliminating, scent-free laundry detergent such as H.S. Scent-a-Way detergent from Hunter's Specialties. The scent-free clothes are then dried without using a scented softener sheet. Next, the clothes are stored in a way that prevents odors from contaminating the garments. Hunter's Specialties' Deluxe Scent-Safe Travel Bag is the perfect solution. It makes storing and transporting scent-free clothing trouble-free. Simply layer the garments in the bag and place some Fresh Earth Cover Scent Wafers in among the clothes. 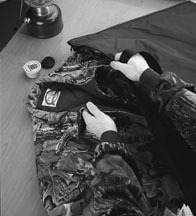 Thanks to a variety of items, remaining scent-free in the field is just as easy as preparing your clothing and accessories. The most versatile of these is H.S. Scent-a-Way spray. Used as the primary step in the scent elimination process, it should be sprayed liberally over clothing, boots and equipment in the field. Used before and during a varmint hunt, Scent-a-Way spray prevents human odors from beginning or helps cover or eliminate any scent that was missed during the first steps of the procedure. Sometimes staying scent-free isn't enough. Often a hunter needs something a little more attractive in order to convince a varmint that all is well or that an easy meal is close at hand. H.S. liquid and solid scents and lures are the answer in these situations. Hunters should remember that many of the Hunter's Specialties products can be used for something other than their intended purpose, often very successfully. For instance, bear and coyote hunters in many of the western states have discovered that both of these high-level predators are very attracted to H.S. BucRut Solid Scent Wafers, a product that was developed for use initially by whitetail hunters. Users aren't exactly sure why the BucRut Wafers attract these varmints, but they do know that oftentimes wafers left at a calling site will be bitten and chewed. Cow elk urine and whitetail doe urine are both effective. The benefits are two-fold. First, these strong odors serve as cover scents. Secondly, because both bears and coyotes, as well as the larger cats and even the opportunistic red fox, prey upon elk calves and whitetail fawns, the heavy scent of cow elk or doe urine can lead them to believe that an easy meal is at hand. For more information on Hunter's Specialties products, visit www.hunterspec.com.